It even has a place to hang the toilet paper! Our youngest daughter Maria is about four months away from her third birthday. 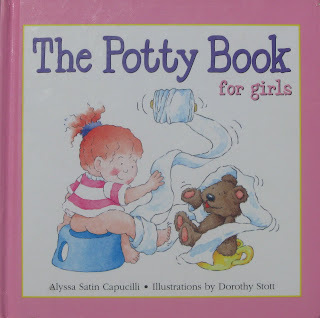 According to the literature on the subject, this means she’s well within prime-time potty training territory. As the baby of the family, we’ve had a much more laissez-faire attitude with schedules and benchmarks and developmental milestones with Maria than we did with Jessica. 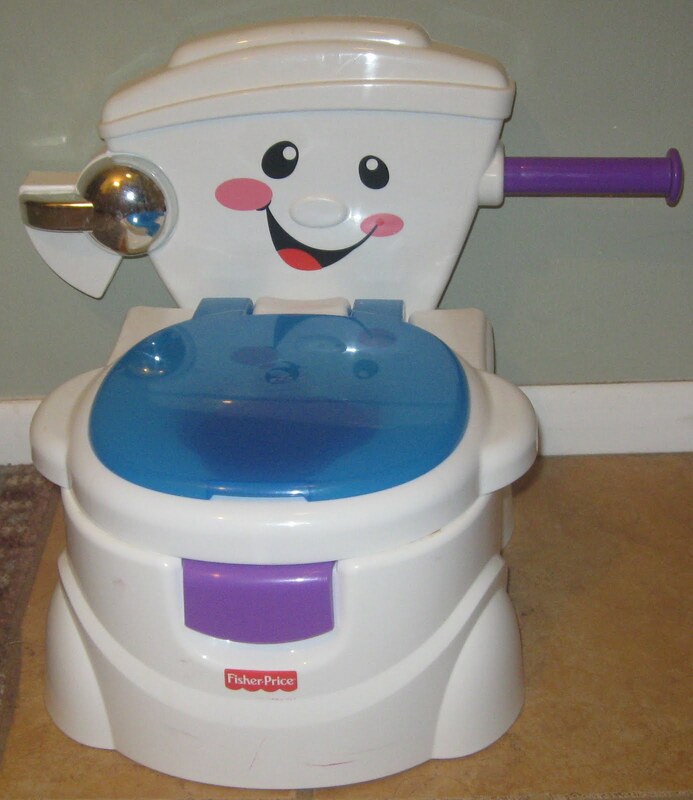 We haven’t done much to initiate the potty training process, except Elizabeth did bring home a cute little kid’s potty, which we quietly placed in the bathroom, just allowing subconscious acceptance of its presence there to build. Maria's or ours, I’m not sure whose. It’s languished there almost unnoticed by all of us for several months. As parents, it can be a difficult and emotional line to walk, torn between the desire to cling to the last remnants of infancy and the desire to save forty bucks a month on diapers and diaper-related expenses. Saving money happens to be a very emotional issue for me. Even without that, however, it can be a bit of a struggle for many parents, especially when it comes to their last child. But the delicate equilibrium we had semi-consciously sustained has now been thrown into tumult. Last weekend we were visiting at a friend’s house, and at one point early in the evening, this very beautiful little girl, who’s about four months younger than Maria, approached our friend, who was babysitting her and her brother. We noticed she said something to our friend, who then started to excuse herself. “What’d she say?” Elizabeth asked. 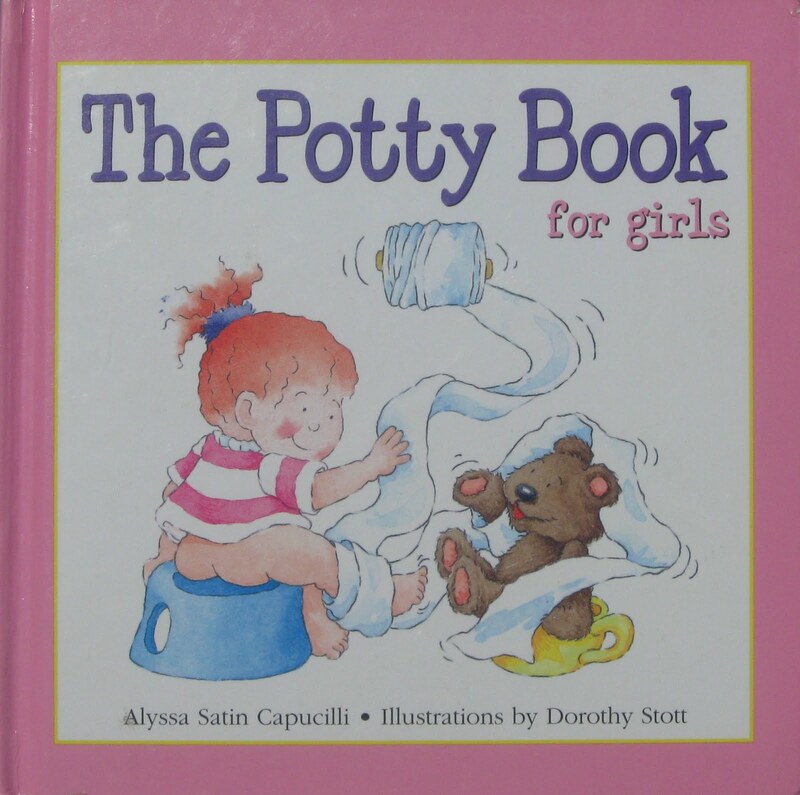 “Oh,” our friend replied, “she was just telling me that it’s time to use the potty.” She took the little girl by her outstretched little hand, and together they walked to the bathroom. I saw Elizabeth’s head start to rotate towards me, and I felt an arrow of fear plunge into my heart. Her raised eyebrow, coupled with the fixed gaze confirmed it: Houston, we have a problem. Now, in our house, whenever we encounter a problem, or are thrust into new circumstances, or approach change of any type, there is one thing we can be expected to do almost without fail: buy a book. We are book-buying people. No matter what the situation, no matter how strange or obscure the problem may seem, someone’s written a book about it that can help you define it, explain it, give you step by step instructions for handling it, and tell you why it’s not your fault. For some reason, it’s highly reassuring to know that someone else has experienced what you are experiencing now, and lived to tell the tale; and not only that, but had the wits to turn it into a profit-making opportunity. 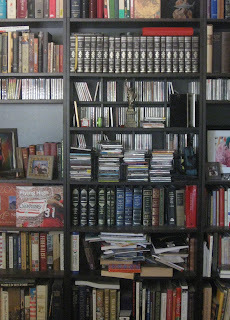 Maybe a quick story here will effectively illustrate just how much faith we place in books. Incidentally, it also illustrates why intellectuals probably shouldn’t be allowed to marry, but that’s not the main point. The story takes place in the year 1991, PI (pre-internet); you know, in the days of Moses, Jesus, and Abraham Lincoln. You need to know this going in, because if you don’t, the whole thing just falls apart. 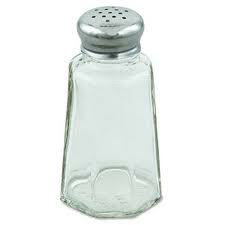 We once had this problem where our salt shakers started clogging up for no apparent reason. 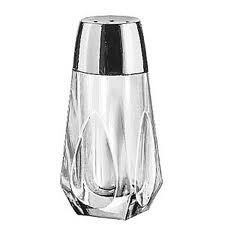 We tried different salt shakers, and bought new salt, but within a day or two, no matter what preventative measures we took, they would invariably clog up again. We tried keeping them cold, keeping them warm, wrapping them in paper towels and suspending them in midair (that was an awkward moment when the maintenance guy stopped in to check our leaky faucet), but the salt inside would always turn into a rock-hard, miniature salt lick. Great if you’re a very small cow, but it made every request for a dash of salt a daunting challenge. “I’m sure there’s a book that can tell us what to do,” Elizabeth said, thereby assigning the job to me. So I searched through our extensive library, focusing on the sections devoted to condiments and common kitchen quandaries, but to no avail. I then went to our local public library looking for answers, but returned in no better position to crack the curious case of the cementing salt. “It’s okay, honey.” I said. I looked around the kitchen, which by now was littered with the pathetic, lifeless bodies of salt shakers we had bought and filled with salt, only to see their innards turn solid overnight. 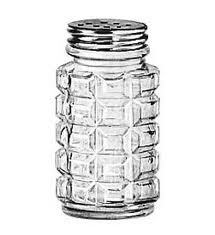 We had taken to pillaging Salvation Army and Goodwill thrift stores across town to supply our constant need for more salt shakers at a discount. “We’re collectors,” we would tell the cashiers. The more thoughtful ones would ask why we only collected salt shakers, to which I would reply, “Because that’s where the money is,” giving them a duh-uhhh look before quickly departing. But now, surveying the carnage of plastic cylinders and glass jars and a wild assortment of ceramic dogs and cats and other animals, separated forever from their pepper mates, I was struck by the devastation wrought by our dilemma. It was like seeing Sodom and Gomorrah from a helicopter right after God let them have it. “Look, maybe I can just take a knife and stick it up the filler hole, and kind of twist it around to get some salt out,” I suggested helpfully. It was the only solution I had come up with in all that time. “No,” she said. “That’s no solution. How will that look in front of our guests, you jamming a knife up into a salt shaker and scraping like a maniac.” Her eyes had a far-away, helpless look. I looked around slowly, suspiciously. “We don’t have any guests now,” I said, uncertainty in my voice. “Do we?” Sometimes we did have guests show up unexpectedly, which always made farting much more difficult. “What?” she replied, eyebrow raised critically. “Just as soon as I’m done with it,” I replied. We became huge fans of pepper from that point on, using it liberally, to the point where the sound of sneezing became indelibly linked to dinner. We still kept one salt shaker out, though, even though we couldn’t use it. I guess it was in case we ever had very small cows show up as unexpected guests. 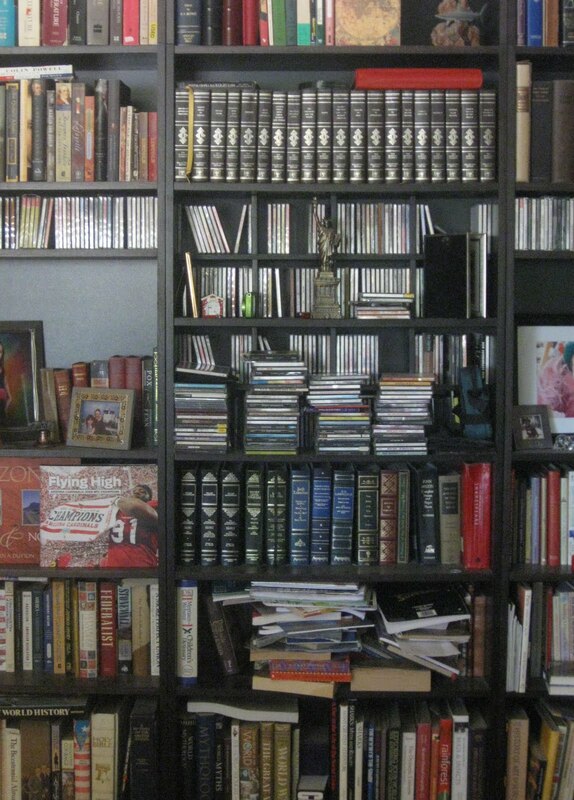 This little anecdote should give you a pretty clear idea of just how much we rely on and value books in helping us to navigate through life. So, with potty-training time suddenly looming, it’s only natural that we turn to books once again to help us manage. And, being evangelists of a sort, we don’t just get books for ourselves; we get books for anyone else involved in the process as well. 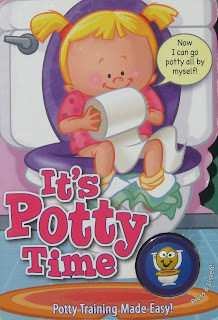 In this case, it was fairly obvious that Maria’s participation was going to be necessary, so Elizabeth went out and found a few kid’s books, one called “The Potty Book for girls,” and the other “It’s Potty Time,” which includes a little button you press to hear a short, but vivid, audio loop of a toilet flushing. Armed with these, and our surviving collection of how-to’s left over from our rookie experience with Jessica, we donned our rain slickers once again and stepped boldly into the arena. The potty-training arena. Those about to potty-train salute you. Peer pressure can be a great assistant in potty training. Case in point, our daughter was older than her friend (and not potty trained) but one day with her friend where the question was posed: "Emily, I'm younger than you. Why aren't you using the toilet? "; potty training came easily and quickly after that. Ah, yes, the positive side of peer pressure. It's funny how we only think of it as being a negative thing. As far as Maria is concerned, I think we'd be wise to keep all our options open. We'll see what happens . . .
Love it, this child hasn't even been on the potty yet and so much thought has gone into it. Perhaps if you tell Maria that we all share in her success she will be motivated. Kevin I love your writing it brings a smile. SB - I think if we told Maria we all share in her success, she would stay in diapers forever! She has a stubborn streak that goes way beyond her years. I think if she even senses that she's about to do something that might make our lives easier, she'll refuse to do it just on principle. I'll have more to say on that later. Adam - You noticed that I was poking a little fun at our book-learnin' ways. I always liked Yogi Berra's take when it comes to forks: If you see a fork in the road, take it!